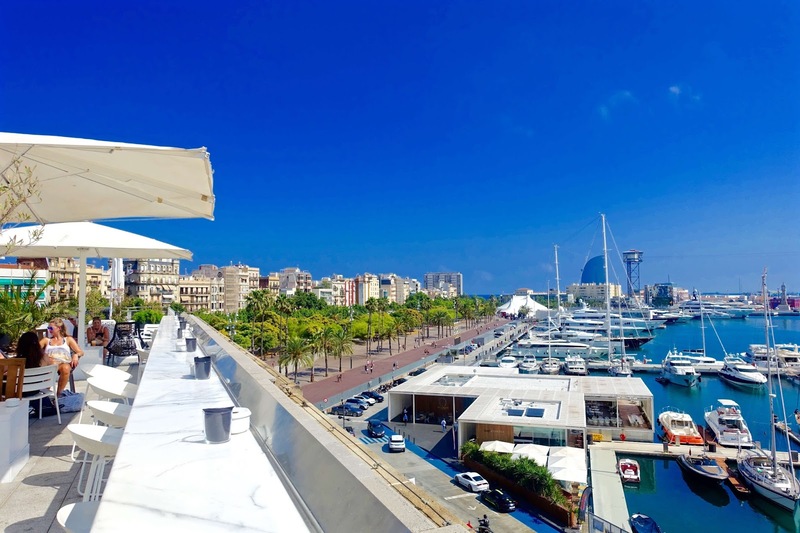 If you're looking for a rooftop bar in Barcelona you are very spoilt for choice, with lots of luxury hotels in the city already boasting their own enviable cosmopolitan outdoor terrace overlooking Barcelona’s gorgeous skyline. However, the terrace of Restaurante 1881 per Sagardi is one of the city’s better-kept secrets. It's actually quite hard to find, take it from us, we nearly gave up after 15 minutes of scaling the building. In order to reach the restaurant and rooftop terrace, you must enter via the Museu d’Història de Catalunya and take the lifts all the way to the top floor where the restaurant is located. 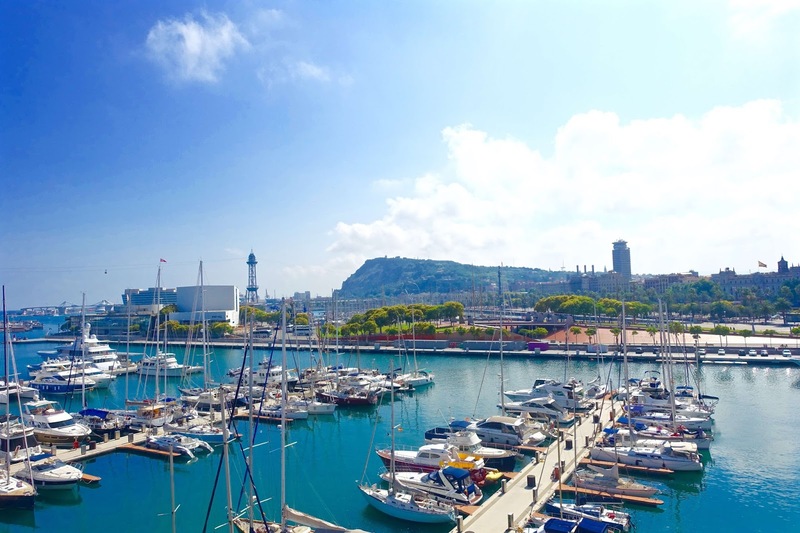 Once you are at the top, walk through the restaurant and you'll immediately see why it was worth finding; with incredible views overlooking Barcelona's skyline and blue marina. It really is a unique place to sit back, enjoy the view (and thankfully a breeze every now and again!) and indulge in the extensive and creative cocktail menu. 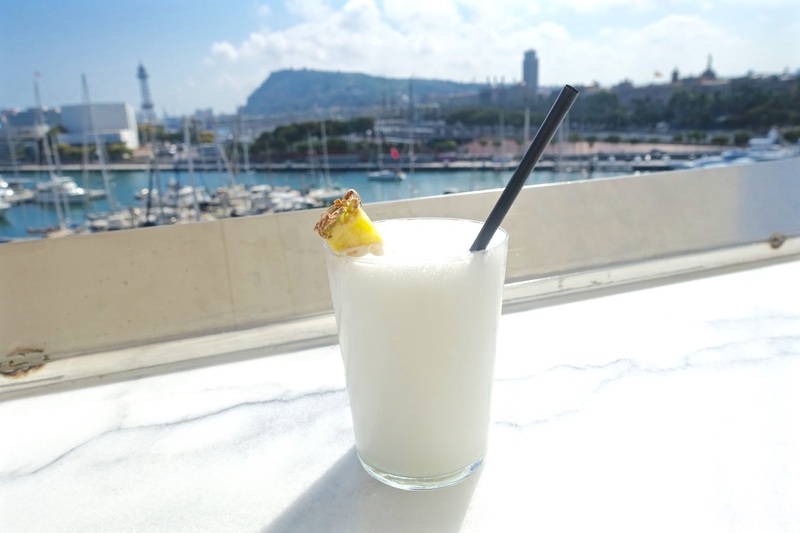 The outdoor terrace is adorned with white marble table tops and lush greenery, & it felt utterly tropical being high up in the 30-degree heat and in fact, an absolute necessity to order a Pina Colada, which was delicious by the way! I'll be honest, before my trip to Barraca, I was extremely misinformed about Paella and what exactly it was. I had always assumed that Paella was only ever a rice dish full of fish, basically prawns, clams, mussels etc. Don't get me wrong, I really like fish, in particular, white fish, but I'm really not keen on prawns or mussels at all, so Paella has typically been something I've steered away from. & that’s when I discovered, hands down - the best (and only) paella I've ever had! 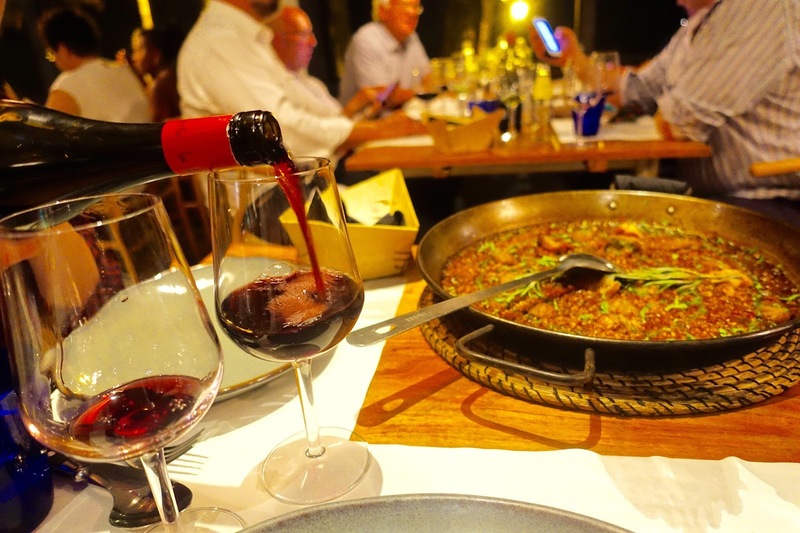 The meat-based paella at Barraca was for 2 people to share, served in a large shallow pan and the dish featured mixed rice with chicken, rib, tender bean, artichoke and sausage paired with a bottle of Spanish red wine - ahh blissful! Every bite was delicious, flavoursome with smoky notes throughout. It’s worth noting, we spent most of our time walking everywhere in Barcelona, not once did we catch a taxi (apart from when traveling to and from the airport) and on this particular evening we decided it would be a good idea to walk from our hotel to the restaurant - it was later at night so the heat was definitely more bearable, however the walk did take us around 45 minutes, which is fine - I love strolling around Barcelona, especially at night, but by the time we arrived we were suuuuper hungry and starting to get a bit agitated. 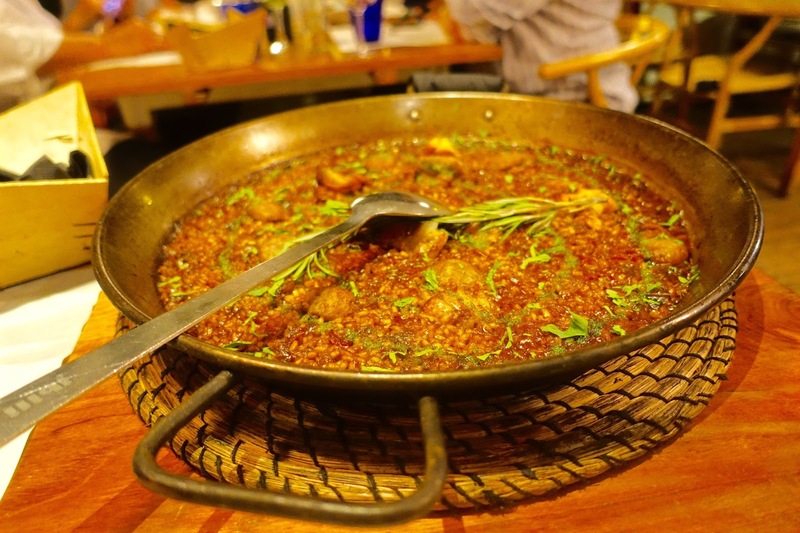 The best thing about dinner in Spain? 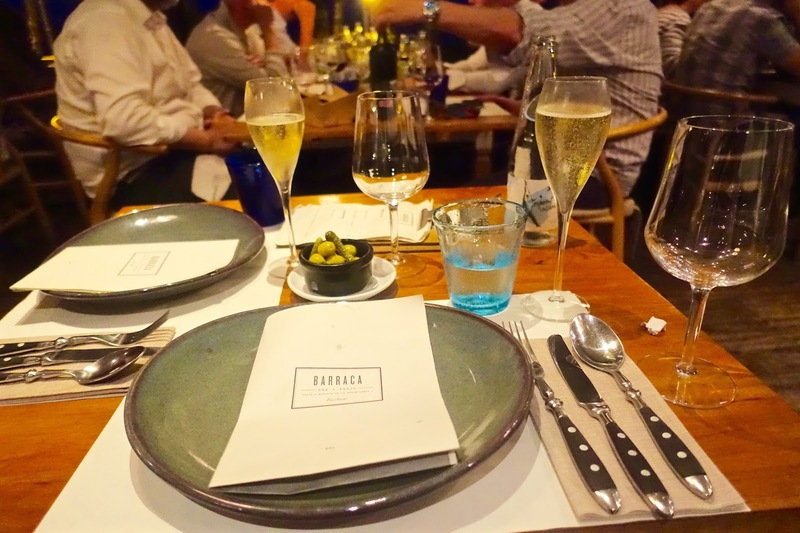 You can rock up at 10.30pm at night to be seated for dinner, and that's exactly what we did and when we arrived, the atmosphere was absolutely buzzing. 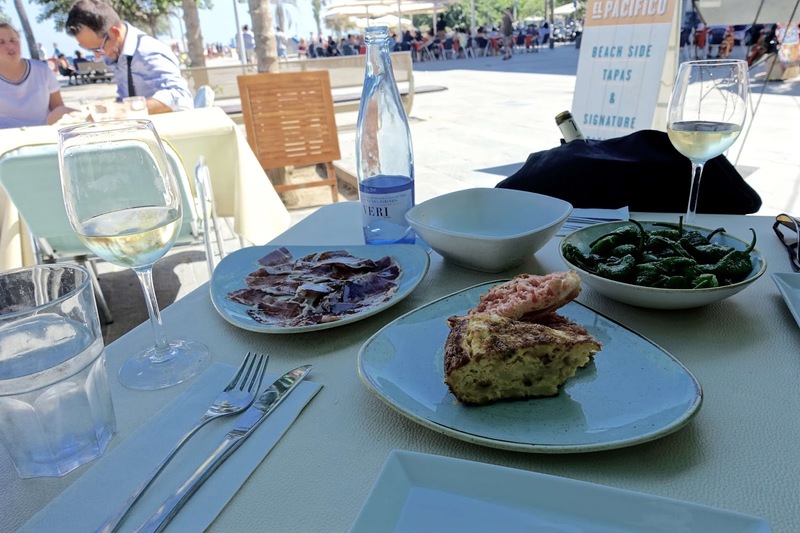 The food is fabulous, but what’s more, the restaurant is situated right in front of the sea so you can enjoy the views of the beach of Sant Sebastia in Barceloneta while you dine and sip on red wine. Late at night, they still have the windows and doors open on the terrace so it feels like your dining in the open air. Best for: Late night wining and dining! The restaurant is inside but with a beachfront breeze - basically it's undercover but all the windows and doors are open while you dine, amazing experience when you rock up at 10.30pm in the evening. Recommended Dish: The meat-based paella was absolutely amazing. Me and Alex reminisce about this restaurant and the paella dish all the time! El Nacional is a unique place to visit because you have 4 gastronomical spaces and 4 specialised bars at your disposal, all under one roof. It is the first restaurant in Barcelona that has different spaces for you to enjoy traditional recipes of the Peninsula, made with high-quality products in a unique atmosphere. If you’re feeling fancy, there’s even an oyster and champagne bar on site! 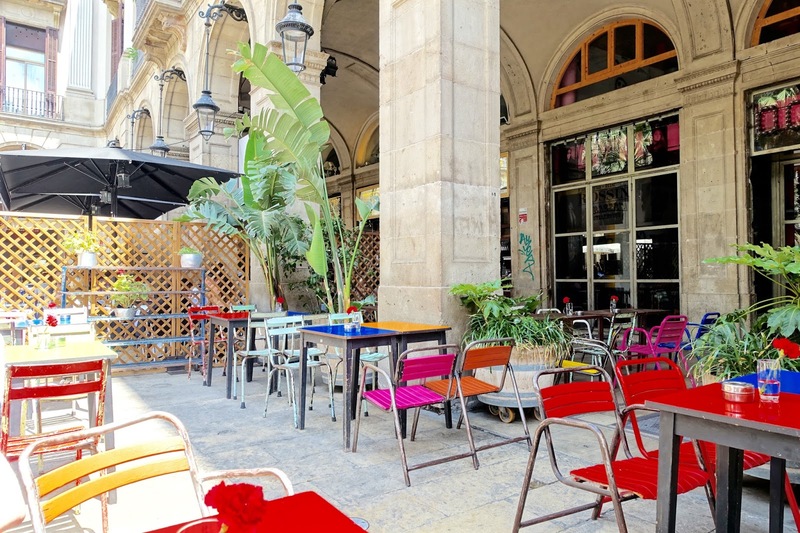 Located in the heart of Passeig de Gràcia, it is a reflection of the social and cultural life of Barcelona. 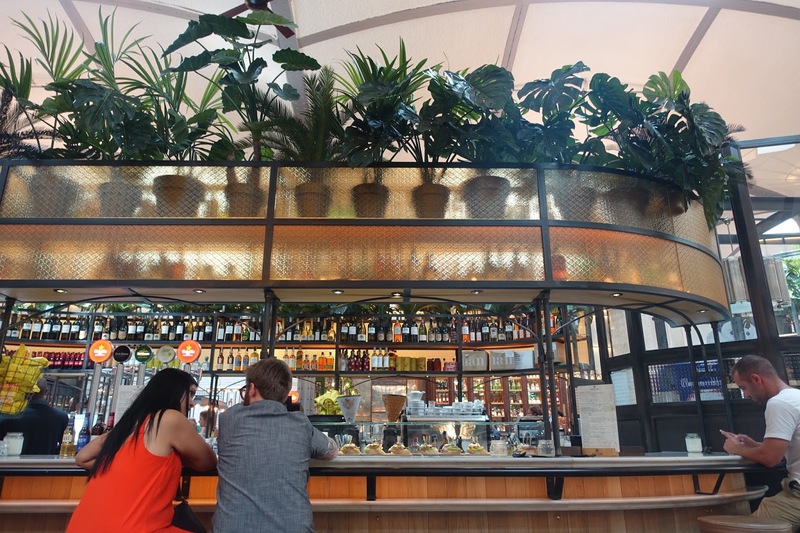 On our visit to El Nacional, we visited La Taperia - an informal tapas restaurant where you can try delicious tapas and rice dishes, auctioned “Malaga-style” by the waiters. There’s a wide variety of cold tapas, hot tapas, rice and paella dishes to choose from and of course glasses of Cava by the tap! Selfie queens take note - the toilets were seriously instagramable and reminded me of the floor to ceiling tiled toilets you find in Iberica restaurants in the UK. 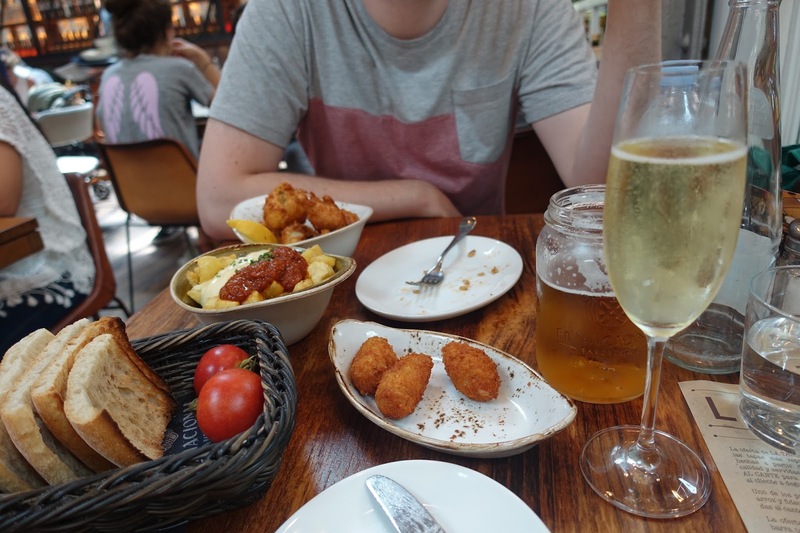 Recommended Dish: You need to try all the usual tapas - ham croquettes, Padron peppers, tomato bread, tortilla! Ocana is a vibrant cafe, restaurant and cocktail bar by day and club by night. 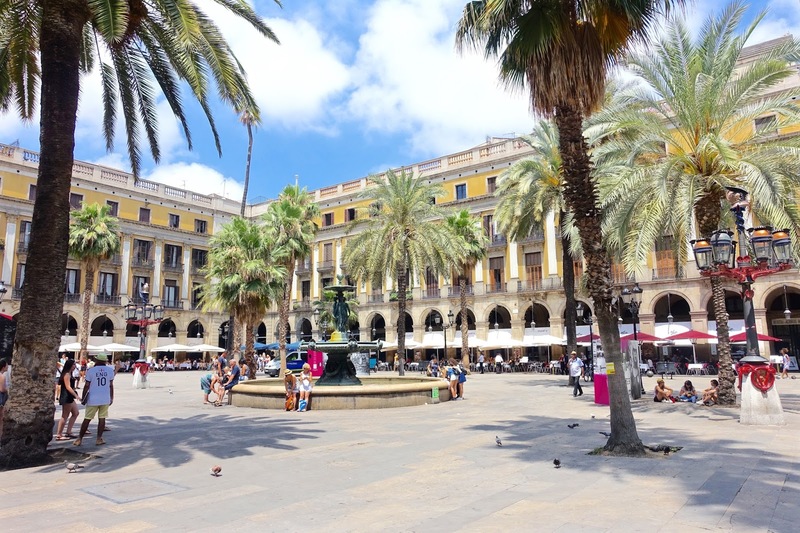 Located in the trendy public plaza, Placa Reial in Barcelona's popular Gothic Quarter. 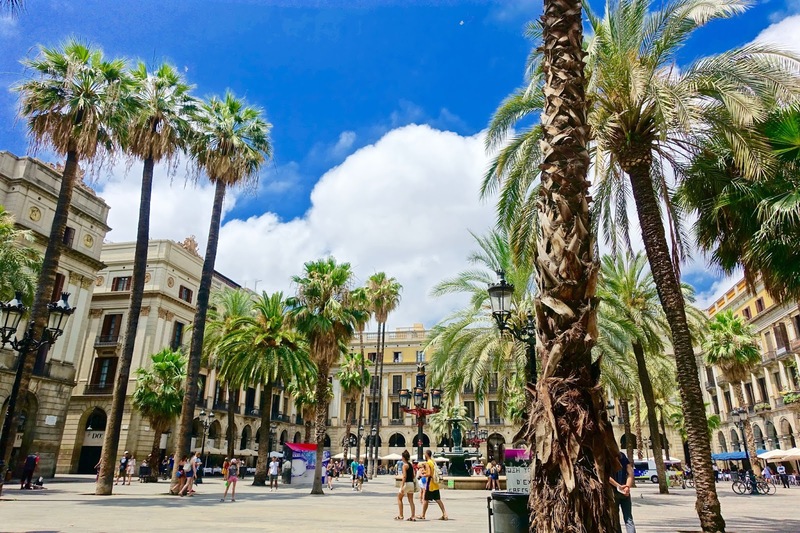 The plaza itself is one of Barcelona's most famous and beautiful squares, where a fountain takes center stage and the enviable square is scaled with luscious tall, green palm trees with a collection of restaurants and nightclubs scattered around the outside. 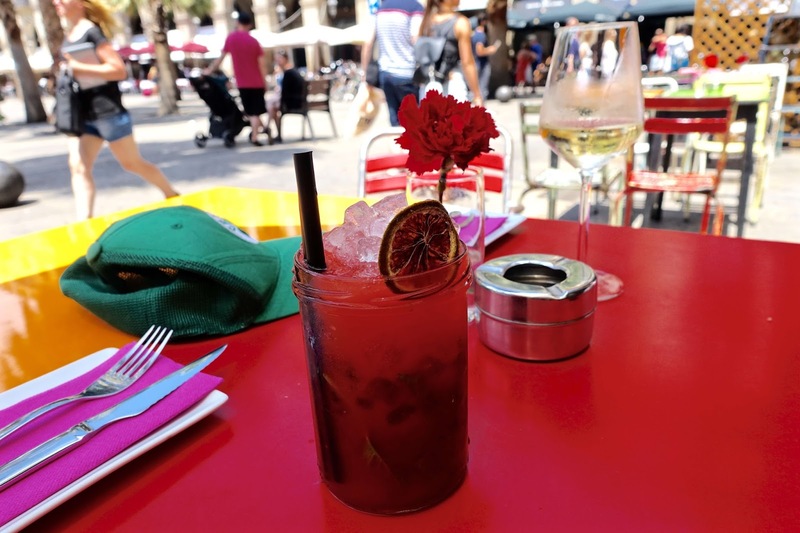 The essence of the Real Plaza is flowers, colours, and people - it is just a very vibrant place to be and well worth a visit if pottering around the Gothic Quarter and looking for a food and drinks pit-stop. 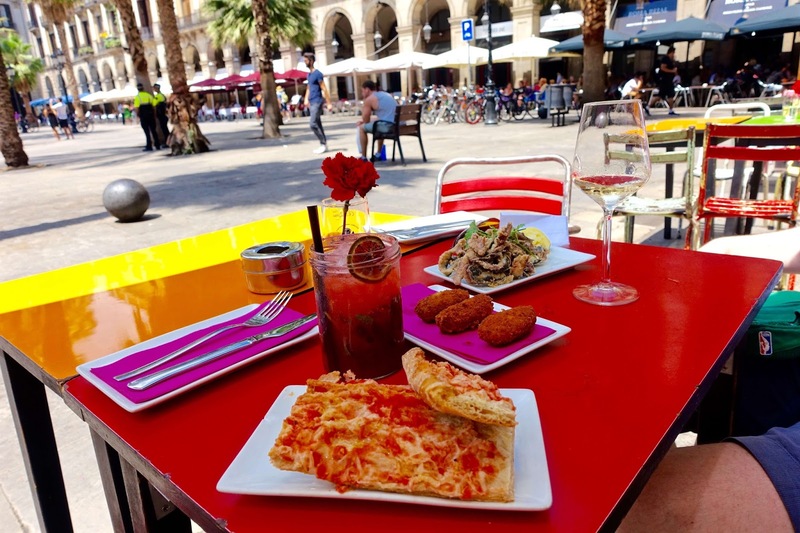 All the restaurants and cafes have their own outdoor seating so there's plenty of other trendy eateries to choose from if Ocana happens to be full. We choose Ocana because a work colleague of Alex's who lived in Barcelona recommended, as well as our Lonely Planet guide. We had been walking around in the super hot 32-degree sunshine for quite a while so paused for cocktails and some traditional tapas; Iberico ham and cheese croquettes, tomato bread and crispily fried mackerel of course! If you're sitting in the outdoor terrace, don't neglect to take a sneak peek inside; it's super spacious, with high, never-ending ceilings and a moody and romantic vibe with red and pink-washed walls and dim lighting - very suitable for the Gothic quarter! Great place to visit by day, or by night! Recommended Dish: Iberico ham croquettes of course! El Pacifico is one of many beach-side restaurants where you can eat traditional food from Catalonia and Spain and drink fresh and friendly cocktails or a good glass of honest wine. 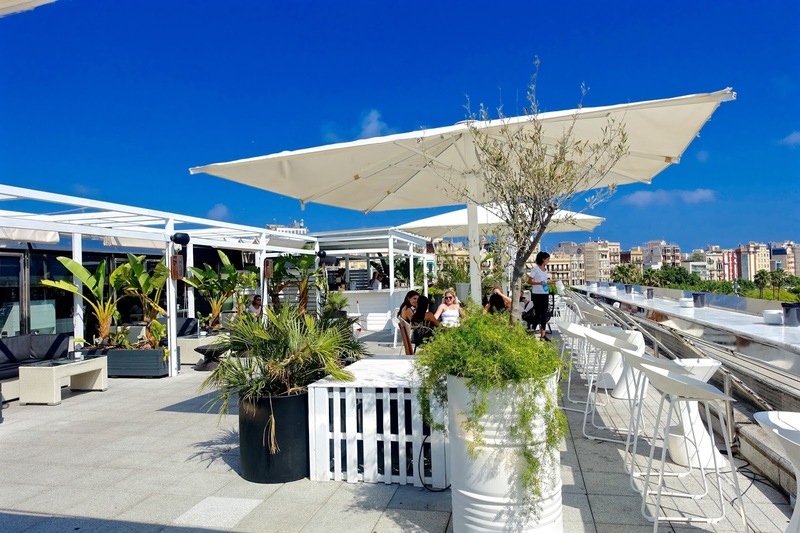 There is a small seating area indoors, however, the terrace is the place to be seated, between the palm trees you have a direct view of the beach and the boardwalk of Barceloneta. It's the ideal place to sit and watch the world pass by - a great spot for people watching! Recommended Snack: Patatas bravas and tomato bread! 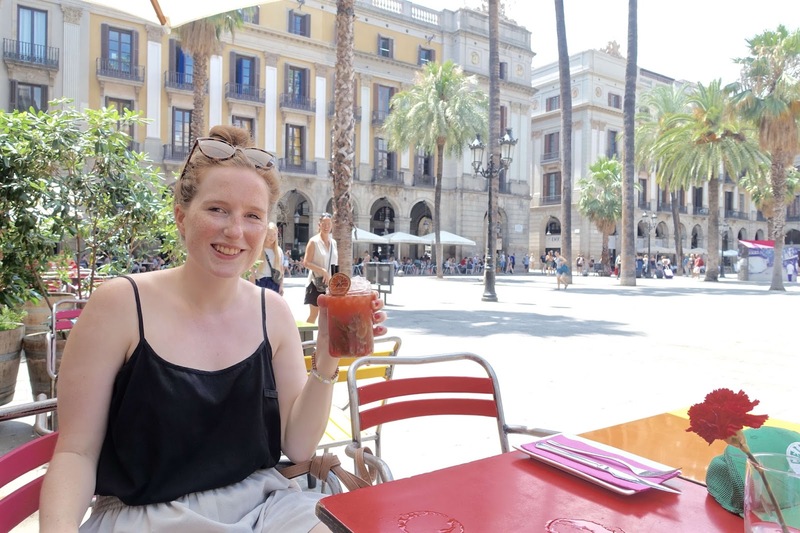 & if you're looking for places to stay in central Barcelona look no further than NH Collection Barcelona Podium Hotel located near the Plaza de Cataluna - we loved staying here, with close links to plenty of trendy restaurants & bars. 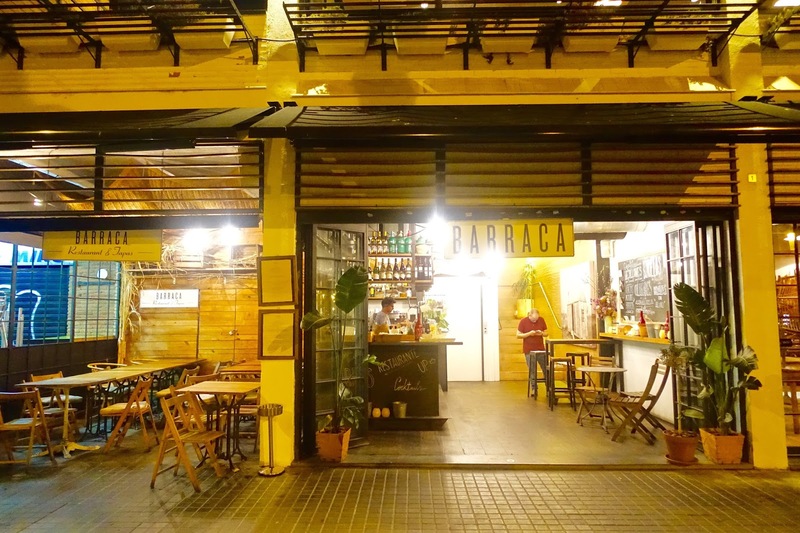 Where are your top restaurants and bars to visit in Barcelona? I'd love to hear your recommendations, please share them below so I have more places to explore when we next visit!